Heat oven to 400°F. Mix vegetables, chicken and soup in ungreased 2-quart casserole. Stir remaining ingredients in small bowl with fork until blended. Pour into casserole. If desired, stir in 1/2 teaspoon dried thyme leaves, dried sage leaves or pepper. Use condensed cream of mushroom soup or condensed cheese soup instead of the chicken soup to give this dish a whole new taste! 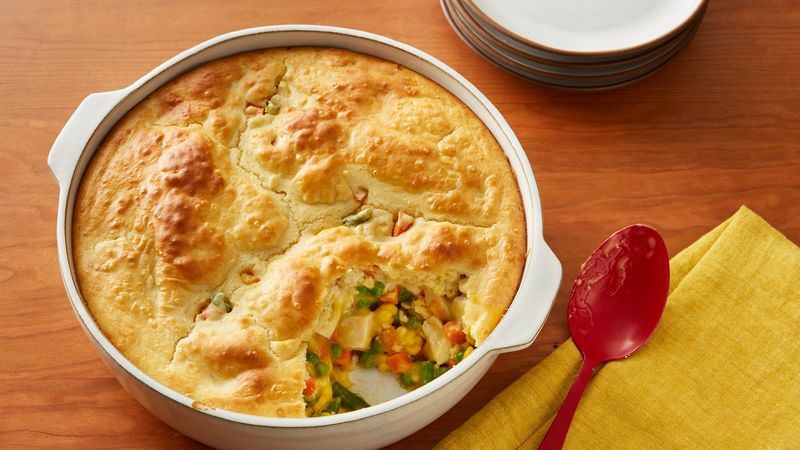 For Hearty Beef Pot Pie, use 1 cup cut-up cooked leftover or deli roast beef instead of the chicken and condensed cream of mushroom soup instead of cream of chicken.